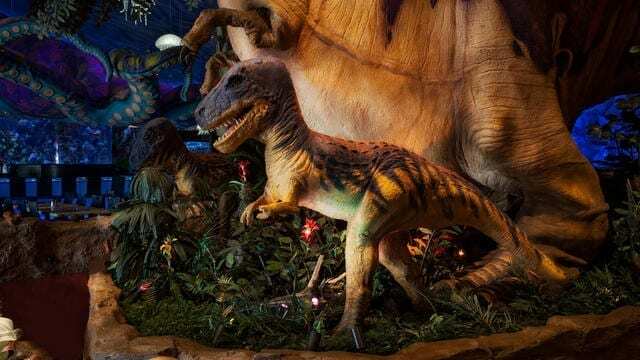 If you or someone in your family has a love for dinosaurs and all things prehistoric – the T-REX restaurant needs to be put on your must-do list today! Even if you aren’t an avid dinosaur fan, chances are after you experience a meal at T-REX, you’ll have a new love for our short-armed prehistoric friends! Here are 6 things we feel you should know before dining at T-REX. One of the best things about T-REX is that it is located on the Marketplace side of Disney Springs. We especially love this because lunch or dinner plans at this restaurant don’t required park admission and parking is free! 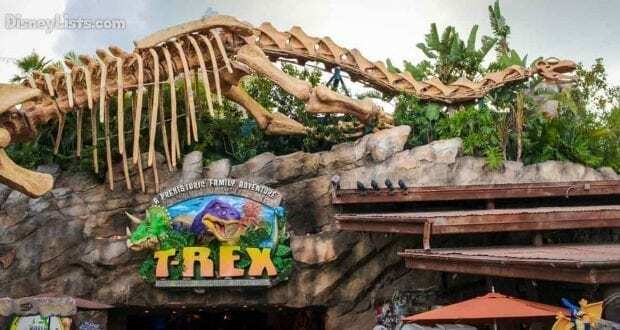 Whether you are at Disney Springs for a day of shopping and exploring, or just want to stop in for a meal – T-REX is an exciting restaurant selection on Disney World property that doesn’t require a ticket. As you walk up to T-Rex, you’ll immediately be greeted by a massive dinosaur fossil. 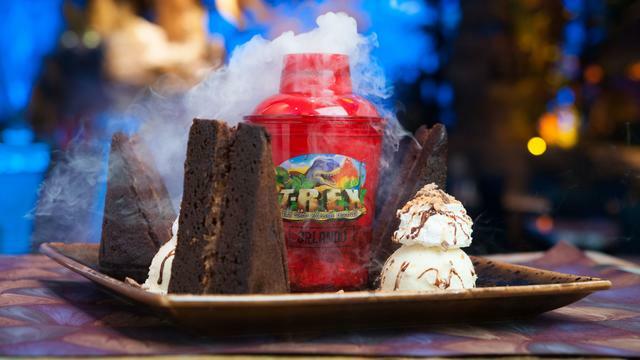 Your Jurassic adventure has only begun as the restaurant unfolds inside to multiple themed rooms such as a color-changing ice cavern to a fern forest. Multiple animatronics such as a 15-foot Tyrannosaurus Rex, mammoths, pterosaurs, triceratops, and a huge octopus are scattered throughout the restaurant making it feel like a museum that has come to life! Just when you have settled in from all your exploring, a meteor shower will strike! The rumbling and earth shattering noises will make the prehistoric animals roar with fear and excitement. The meteor shower takes place every 20 minutes so you’ll likely catch this experience a couple of times while you dine. Serving lunch and dinner, you’ll want to bring a dinosaur-sized appetite with you! Carnivores, herbivores, and omnivores are welcome and will easily find something on the menu that is just right. The American cuisine menu selections are all the wonderful American foods you would expect but with a fun flare of dino-style themes. Sandwiches, burgers, pasta, steak, chicken, fish, and wonderful sides fill this T-Rex sized menu. We especially recommend the Doublesaurus Burger, Prehistoric Pasta, and Boneyard Buffet just to name a few of our favorites. Our kids love the Cosmo’s Cheesy Macaroni and Dexter Corn Dog. Save room for an outstanding dessert such as the Meteor Donut Bites or the Chocolate Extinction. And adults – T-REX has a superb full service bar with beer and wine as well as specialty drinks such as our favorites – the Tropical Cotton-tini and Raptor Rita. You won’t leave T-REX hungry or thirsty! One step in T-Rex and your kiddos will immediately be thanking you for bringing them to such an awesome restaurant! As if the atmosphere, animatronics, meteor showers, and incredible food and desserts isn’t enough for them, you can also let your children enjoy some time in the Paleo Zone. This is a great place for a fun hands-on experience where kids can dig for hidden dinosaur fossils, pan for treasures in a creek and have a little learning experience about the prehistoric period through interactive displays. Snag yourself a T-REX souvenir from the Dino-Store located at the restaurant entrance and exit. This dinosaur-themed merchandise includes fun toys and dinosaur apparel among other items. There is also a Build-A-Dino Workshop that is the same as a Build-A-Bear Workshop but with all things dinosaur instead! We highly recommend that if at all possible, you make advanced dining reservations. T-REX is a super popular spot and reservations can be hard to snag so the earlier you book (180 days in advance) the better chances you have at getting the day/time you would like. If T-REX is accepting walk-ups, you can expect to wait for a long period time which may make for good dinosaur shopping time! We also suggest that if you are looking for a quiet experience, perhaps for an anniversary or couple gathering – T-REX is not the spot for you. Our experiences there have been noisy which is spectacular with kids, but tricky when trying to carry on a conversation. We also suggest that once you are seated, you go exploring around the restaurant to the other themed rooms. Just because you are seated in one spot doesn’t mean you have to miss out on seeing the surrounding spaces. We hope you have a fantastic dining adventure at T-REX! We’d love to hear about your experience!